LOS ANGELES, August 29, 2018 – Sean McElwee and Megan Bomgaars are talented designers who have sold products featuring their designs to make a living. These entrepreneurs also happen to have Down syndrome. McElwee and Bomgaars are cast members on “Born This Way”, an Emmy award-winning unscripted reality television program created by Bunim/Murray Productions and airing on A&E Network. “Born This Way” stars seven young adults with Down syndrome and their families, and showcases their lives in a positive, accurate way. The fourth season of the hit docuseries highlights McElwee’s and Bomgaars’ businesses, both of which have made remarkable progress in recent months. Having a new brand, having a new style – I'm kind of emotional because this is a dream that I've always wanted. I'm building a new Megpire. In the current season of “Born This Way”, Sandra works with Sean to more effectively manage the range of designs offered and to eliminate designs that did not sell very well. Sean’s mother knows that Seanese is going to be an important source of financial support for Sean, but he has to be happy with the products they are putting out. A year ago, Sandra told RespectAbility that Sean “comes up with [ideas] that I wouldn’t think of myself.” This week’s episode of “Born This Way” will show that this is still the case. Stay tuned for a conversation between Sean and his mother over which designs to order and sell at a pop up shop – airing Wednesday, Aug 29 at 8 p.m. ET / 7 p.m. CT on A&E! Megan Bomgaars also runs a business with her mother. 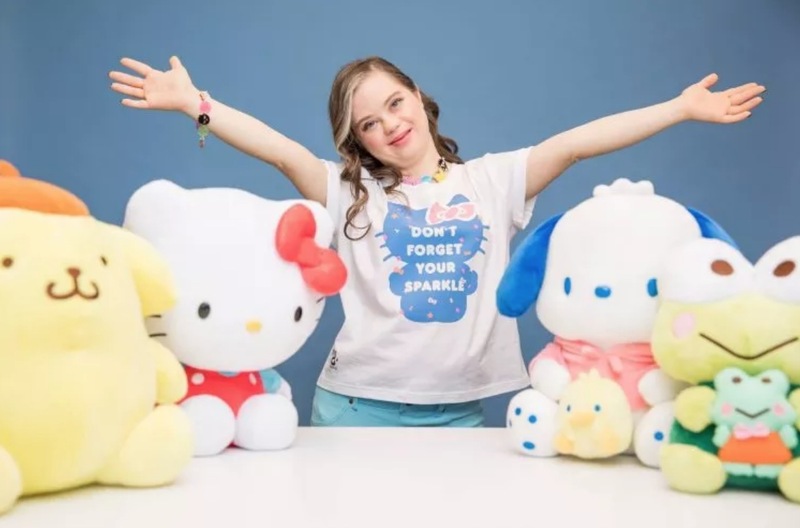 Megology sells t-shirts with the words “Don’t Limit Me” on them, a reference to a video Bomgaars made with her teachers at school. Megology also sells hand dyed silk scarves, tote bags and phone cases. On last week’s episode of “Born This Way”, Bomgaars met with executives at Sanrio, the company responsible for Hello Kitty. The meeting resulted in a partnership, Sanrio ♥ megology. The fashion collection features Hello Kitty characters alongside megology branding and empowering text. An estimated 15 percent of business owners are people with disabilities. Another man with Down syndrome, John Cronin, and his father created John’s Crazy Socks. Former President George H.W. Bush is a repeat customer of Cronin’s company. He tweeted a photo of one pair he purchased for World Down Syndrome Day, and a few months later, he wore socks he bought from John’s Crazy Socks to First Lady Barbara Bush’s funeral. In Iowa, brothers Jake and Josh Spece may have spinal muscular atrophy and use wheelchairs to get around, but neither allows his physical limitations to get in the way of his dreams. While Jake owns Johnston Creek Farms, where he provides customized feeding and tending of baby calves for farms and agribusiness in the area, his brother Josh owns and operates In The Country Garden and Gifts, a garden and gift shop located on the family dairy farm. Josh founded the shop business in 1998 with some artistic collaboration from his mother, Sue Spece. Down the road, Emilea Hillman is well known for leaving a segregated workshop and becoming a business owner with the support of her family, the Iowa Vocational Rehabilitation Services’ Self-Employment Program and other agencies. Born with a congenital condition causing a lack of nerve tissue connecting the left and right side of her brain, her parents were given little hope that she would learn to walk or talk, much less that she would ever be gainfully employed.Now she owns and operates Em’s Coffee Shop in Independence, Iowa. Em’s is known as the place where local, state and national candidates and elected officials from both parties have come to meet voters and constituents. Former U.S. Sen. Tom Harkin has visited on multiple occasions. Hillary Clinton visited during her presidential campaign. Hillman also was invited to the White House to witness former President Barack Obama signing into law the Workforce Innovation and Opportunity Act (WIOA) following overwhelming bipartisan support in Congress. Hillman’s entrepreneurial spirit and goal-oriented attitude serves as a role model for other young women with disabilities looking to become business owners around the country. Partnerships with state vocational rehabilitation services and proper training are the building blocks for people with disabilities to create successful business models that benefit their entire communities. As more people with disabilities enter the workforce, some are finding entrepreneurship as their best path, so much so that the National Association of Workforce Boards has programs in place for entrepreneurship by and for people with disabilities. Their CEO, Ron Painter, was enthusiastic about this topic, saying there are “a lot of workforce boards across the U.S. that are investing in entrepreneurship training” while at a day-long summit about the future of Americans with disabilities organizing by RespectAbility, a nonprofit organization fighting stigmas and advancing opportunities for people with disabilities. Painter stressed that entrepreneurship is a great option for people with disabilities to have a fulfilling life and support themselves financially. Aspiring entrepreneurs with disabilities clearly have plenty of examples to model their business after. High expectations and family engagement are key parts of promoting independence and improving employment outcomes for young people with disabilities. The examples cited above are succeeding because their parents continued to have high expectations for their children as they entered adulthood. Expecting and working toward success are motivational factors that can support the ultimate entry of a student with disabilities into the workforce, especially entrepreneurship. For far too long, people with disabilities have faced stigma, myths and misconceptions about their capacity to work, to become independent and to pursue careers. Setting high expectations for success that begins with families often leads to successful career training and job preparation.